During his long artistic career, John Clymer developed a highly effective process for painting the history of the American West. First, he and his wife, Doris, would painstakingly research the subject of the painting, down to the smallest details of setting, climate, and historic period. After completing their research, they would then travel to the proposed site for the painting to get a firsthand feeling for the area. As a result of these intensive preparations, Clymer’s paintings are both rich in accurate historical detail and successful in capturing the essence of their geographical settings. Clymer was adept at recreating an historical event or era while, at the same time, drawing the viewer into the physical scene. Clymer was born in Ellensburg, Washington, in 1907. By the time he joined the Cowboy Artists of America in 1969, he had achieved a highly successful career as both an illustrator and easel painter. Through his work for the Saturday Evening Post, he brought images of the West to literally thousands of Americans. From 1942 to 1962, Clymer painted more than seventy cover illustrations for the magazine, many of them Western scenes. 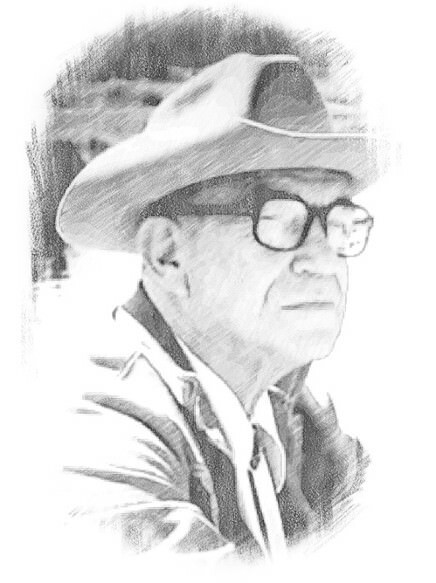 In the era before television, Clymer’s illustrations served to introduce countless people to the many stories of the American West, from the fur trade to the cattle drives. He literally bridged two generations of Western artists – the early twentieth century illustrators such as Harvey Dunn, with whom he studied, to the members of the CAA, for whom he served as mentor and role model. Clymer was particularly interested in depicting the history of the Pacific Northwest, where he grew up. He attempted to tell the whole story of the region, creating sensitive and detailed depictions of Native American life and the meeting of Native and Anglo cultures. One of his featured subjects was the great fur trade era, which led to the exploration of the region. Clymer was also equally talented in depicting the native wildlife of the Pacific Northwest. Fittingly, his life and work is now commemorated in the Clymer Museum in his native town of Ellensburg. Antagonism between the Indian and the White Man is a common thread throughout the history of the American West; even a casual purview of the relations of these two peoples reveal an abundance of conflict, confrontation and tragedy. Yet, there are notable exceptions to this shadow over the Old West. There were men who came as friends and were able to live at peace with the Indian. One of these men was the independent trader, James Bordeaux. 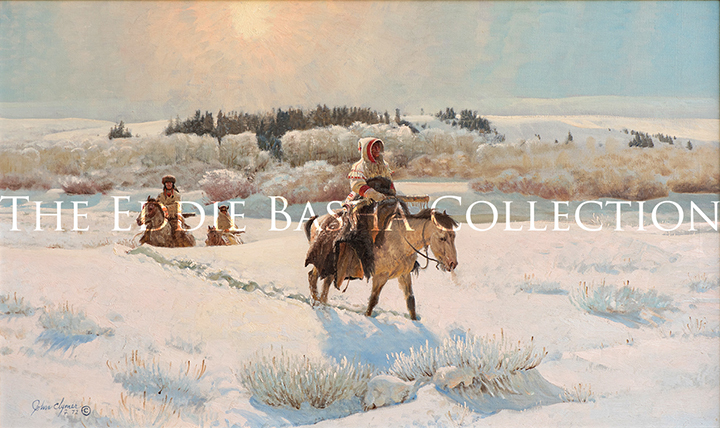 In 1856, when many bands of the Sioux left Fort Laramie and Major Twist, the Indian agent, moved the agency away from the Fort, James Bordeaux went among the Brule Sioux on the White River with his Red River carts to trade. Bordeaux was married to the daughter of the Chief of the Brule. His interest in the Sioux people went much deeper than the considerations of commerce. He found the Sioux way of life to be in harmony with creation; a quality already lacking among the whites as they sought to subdue nature and turn it to their own purpose. This unusual man considered the Sioux as his friends. He conducted himself as a guest in their camps and dealt with them fairly in his business at their camps and at his trading posts. The name of James Bordeaux is not as familiar as are those of the white men who made their reputations as Indian fighters. We can only speculate about the course of history had there been more men like James Bordeaux in the vanguard as white civilization pushed into the land of the Indian in the early West. By the mid-1830’s, steamboats were navigating on the Missouri River between St. Louis and Ft. Union more than 2000 miles to the west. This was the avenue of commerce for the fur trade. From Ft. Union, the trappers and traders outfitted and moved on up the Missouri and the Yellowstone in sturdy, flat-bottomed keelboats. Their destination was beaver country and the Indian villages closer to the headwaters of the western rivers. This scene is of a trade boat of the American Fur Company out of Ft. Union and bound for the more remote Ft. McKenzie. The boat was anchored in mid-stream to trade with Indians for beaver pelts, furs, buffalo robes and fresh dried meat. The traders would not bring their boat into shore in fear that the Indians may prove to be hostile. The chiefs come aboard first to talk and receive presents from the traders. Then men and women eager for the white man’s goods begin to swim out to the boat pulling their own trade materials in bullboats made from buffalo hides stretched over willow frames. The white traders become concerned as more and more Indians approach and attempt to board the already crowded vessel. Heavily out numbered, the crew hoists a crude sail and begins to move on upriver, forcing the Indians to disembark. They are told by the traders to come on to Ft. McKenzie for further trade. There the traders will feel more secure in the company of their own kind. Of all the hardy men who challenged the western wilderness of the early nineteenth century, none were more resourceful and tenacious than the free trappers. There was money to be made in trapping to be sure. But, it was something more than greed that drew these rugged men so far away from the comfort and convenience of settled America back east of the Mississippi. Beaver pelts were a way to pay the bill for living out a grand adventure. Men alone in a strange and hard land tested their mettle to a degree more than city-dwelling wage earners would ever know. Out there, in the silence and isolation, a man came to grips with his essence. He gloried in his strengths and fought to overcome his weaknesses. This was no life for those of timid spirits. In the dead of winter, snow lies in deep drifts across the land. Everything is white and the silence is overwhelming. Two men are drawn together by the scant warmth of a small fire and a shared feeling of intense loneliness. Few words are spoken. The men are within themselves, thing perhaps of homes and families thousands of miles away. Maybe they try to muster up memories of last years rendezvous when Indians and trappers came together to barter furs with the traders. Long summer days of noise and zest, and nights of wild tales and raw whiskey. But it all seems so long ago. Now, they huddle near the fire and wait for the cooking pot to boil. Their earthly worth is represented by the fresh furs draped on the bare tree and the traps that hang there, or lay beneath the icy water of a nearby stream where the fox drinks and beaver builds his home. One of the greatest adventures in all of American history was the Lewis and Clark Expedition which set out to explore the vast, unknown territory of the Louisiana Purchase in 1804. It resulted in a fantastic journey from the banks of the Mississippi to the shores of the Pacific Ocean and back. The round trip took more than two years and had tremendous influence in the subsequent settlement of the American West. The cast of characters in this dramatic initial chapter of western history were the two leading men, Meriwether Lewis and William Clark; but the most intriguing character was an Indian woman, Sacajawea. While the expedition was in winter camp at the Mandan Villages in North Dakota in 1805, they secured the services of an interpreter named Toussaint Charbonneau, a French-Canadian trapper whose young wife, Sacajawea, and her new baby accompanied her husband on the journey. Sacajawea was a Snake or Shoshone who had been captured by the Minnetarees when she was about eleven years old. During the succeeding months she was reunited with her people from whom the Lewis and Clark party was able to obtain horses and a guide to lead them across the mountains. She proved a valuable asset to the party as an interpreter and the presence of a woman and child in the expedition was a sign of its peaceful intentions by the other Indians they met. Sacajawea did not remain with the Shoshones but continued on with the group until it reached its goal, the mouth of the Columbia and the Pacific Ocean. In the painting, Sacajawea at the Big Water, a great moment came for her when after having accompanied Clark’s part to the ocean beach where a whale had washed ashore she was the Pacific Ocean for the first time, which she called the Big Water. Trading was as fundamental to Indian life as hunting and war. The system of commerce between tribes within a particular region was quite sophisticated long before the Indian came in contact with white civilization. 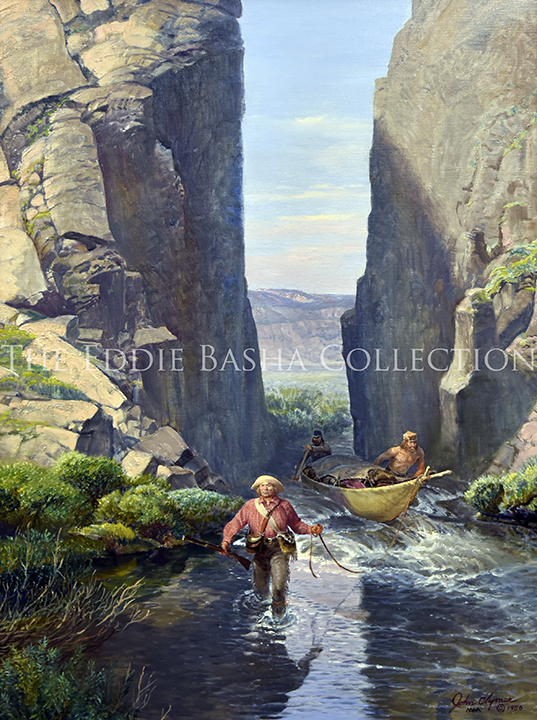 This fine painting depicts two groups of Northwest Indians who have come together to trade at the Cascades of the Columbia River in what is today Washington State. One group has come up from the lower Columbia in dug out coastal canoes bringing shells to trade. These shells were eagerly sought by inland Indians for personal decoration. The Chinook Indians, who lived at the mouth of the Columbia, acquired the shells from other coastal bands and brought them upriver to trade. On this occasion the inland Indians are a band of proud and haughty Cayuse who were outstanding horseback warriors in the area of the Blue Mountains and beyond the Tucanon River. The Cayuse obtained trade goods from other inland Indians at the Grande Ronde and the Walla Walla Valleys. Here the Cayuse, who have arrived by horse, are offering furs and mountain sheep horns in exchange for the shells of the Chinook. The sheep horns were used in making eating utensils and in the construction of bows. Among the shells on display are rare dentaliums which were found only off the coast of Vancouver Island and were highly prized trade items. In their efforts to understand one another, these two trading bands are probably communicating with each other in a combination of sign language and the Chinook jargon which was in common use throughout a wide area of the old Northwest. 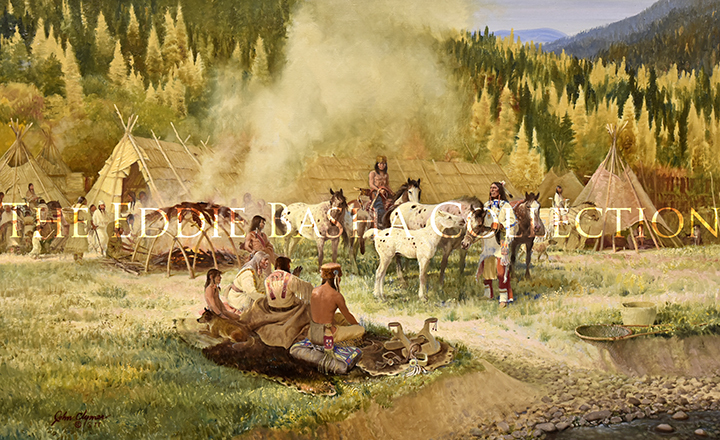 This small trading session along the banks of the Columbia is an example of the kind of trading that went on among the Indians for generations before the white men came to alter the time worn trade routes and patterns of trade that had developed among the tribes. Many strange and wonderful creatures inhabited the remote corners of the American West. Early white visitors were amazed at the endless herds of the shaggy, hump-backed buffalo. They marveled at the spiny porcupine, the fierce badger, and at the architectural enterprises of the beaver. The great grizzly bear struck terror in the hearts of all those who heard its mighty roar. Stories were told of yet another strange animal that lived up above the timberline on the barren and wind-swept slopes of the rugged western mountains. The mountain goat was seldom seen by man. His high country domain was secure from such predators as the wolf and the bear. Indian and white hunters rarely ventured up among the saw-tooth crags and lofty peaks scoured long ago by ancient glaciers. Few creatures would ever know the solitude of that place where eagles soared on the wind of canyon currents and the sure-footed mountain goat made its home. Part goat, part antelope, this unusual dweller of the high places exhibited an amazing ability to live beyond the law of gravity, bounding at ease up and down walls of sheer rock. Great neck and should muscles rippled beneath a tick, Arctic white coat of hair. 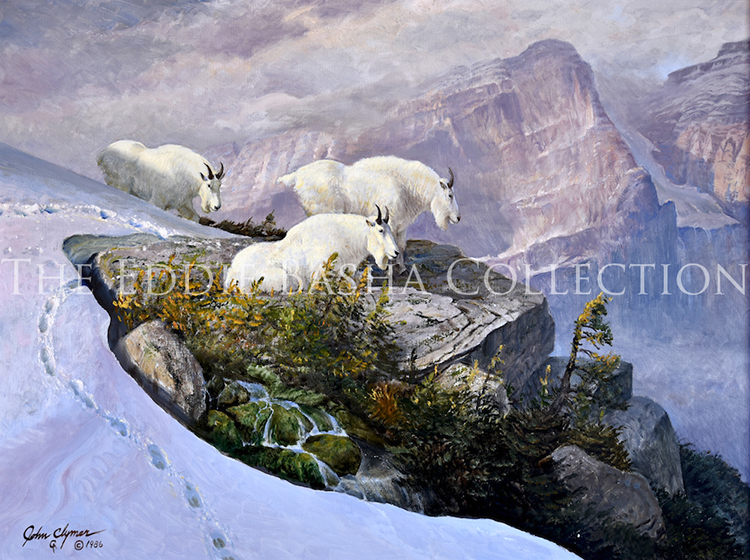 Flint-life hooves surrounded a soft, inner pad and enabled the goats to maneuver across slick rock and ice, and to paw down through the snow to feed on the sparse vegetation which grew at extreme elevations. To those who first saw him, the mountain goat was a mythical creature of grace and power, sure-footed and at ease in a harsh environment far removed from the natural haunts of man. Winter presented a dramatic threat to survival of the fur trappers who challenged the environment of the northwestern wilderness. Night Visitors depicts two trappers who have set up a primitive overnight camp. It is the season of abundant snow and bitter cold. 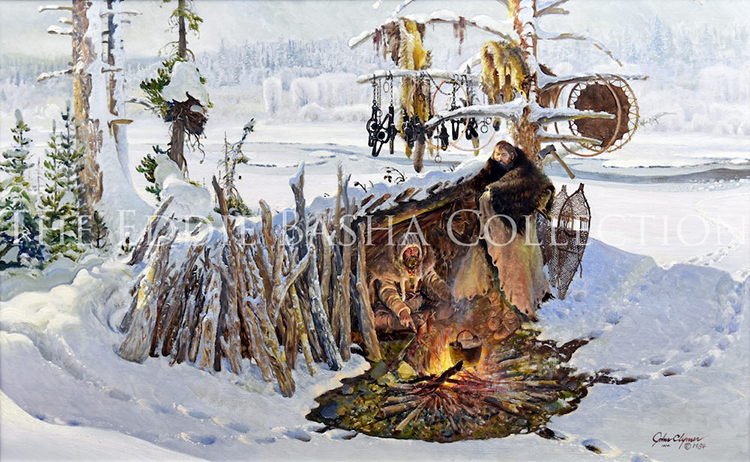 The men have only the small fire, the blanket coats and their companionship to ward off the freezing weather. Yet, the harsh winter was not the only difficulty for the men. Food in the middle of the winter is a prime concern of both man and beast. Wolves have been attracted by the scents of the trappers’ camp. They crouch at the edge of the firelight and wait, a threatening presence. The snow had made their hunting difficult and the wolves are lean and hungry. The trappers will have to keep the fire going all night in order to keep the wolves at bay. Even then, acute hunger may overcome the wolves’ fear of the fire. In that event, the men will have to defend themselves and their supplies. Modern studies have indicated that wolves are not man hunters. The two trappers, though, had no way to know that the animals were attracted only by the smell of the men’s food. The danger seemed genuine and quite close. It will be a long, cold, sleepless night. In the silence which is broken from time tot time by the snarls of the wolves, the men will have time to consider the reasons why they chose this kind of a life and think of homes and families a world away. Scenes such as this were commonplace in the daily existence of this rugged breed of men. With the light of dawn, the wolves will slink back into the forest. The men will welcome the sun and once again find delight and pride in their life and in the wild, wonderful freedom which few men have ever known. Some hunts were so successful that not all of the meat and hides could be brought into camp before nightfall. Small fires were lighted, and a number of women and children of the tribe remained with the carcasses all night to guard them from lurking wolves, coyotes or other predators. In the morning, as soon as it is light enough to see, the women will be back at their work of removing the hides and cutting off the meat. When the Lewis and Clark party reached the mouth of the Columbia River, they decided to winter near the Pacific Ocean. They chose a spot on the south side of the Columbia, on a high point of land above a small river emptying into a small bay. There they built a fort and established their winter quarters which they called Fort Clatsop. From the fort, they sent a party of men out to the coast for the purpose of setting up a camp and a salt-making operation. The camp was on the coast about fifteen miles southwest of Fort Clatsop near the lodges of some Killamuck and Clatsop Indians. There they found a place near a fresh stream of water running into the ocean and plenty of wood for fires. They built a stone cairn which would accommodate the five large kettles for boiling sea water. By keeping the kettles filled and the fires going day and night, they were able to obtain from three-quarters to a gallon of salt a day. On February 21, 1806, when they abandoned camp, they had about twenty gallons in all. They thought this would be sufficient to last them until they reached their caches on the Missouri River. On March 23, 1806, the men of the Lewis and Clark party began their return journey to St. Louis and civilization. The expedition split into two groups. Lewis, along with nine men set out to explore and map the Marias River. The remaining men under Clark continued to the Three Forks of the Missouri in present day Montana. At the Three Forks, they recovered the boats which had been left on the journey westward. Clark then dispatched nine men to meet the Lewis contingent at the junction of the Marias and the Missouri Rivers. Clark and the remaining men set out overland to explore the Yellowstone River. They build two crude canoes, lashed them together and began their trip down the river. This painting, Buffalo Gangue shows Clark and his small band on the afternoon of August 1, 1806, encountering an enormous herd of buffalo crossing the Yellowstone. Consequently, the men were forced to land their canoes until the herd passed. It was a magnificent sight. The buffalo herd seemed to have no end. Clark described them as gangue of buffalo. This incident was but one of many dramatic episodes which were a part of the grand adventure of the Corps of Discovery. Each member of the group retained vivid impressions and memories of scenes such as this. This entire expedition reunited near the mouth of the Yellowstone in mid-August and began the boat trip back down the Missouri. They were back in St. Louis before the end of September. Theirs was a singular and distinguished accomplishment in the history of Western America. The fur trading era was but a brief episode in the history of the early West. But it was the period when white men first ventured in any significant numbers beyond the pale of civilization to the wild country of the western mountains. Men who prized freedom and independence in its purest forms embraced the chance of a life away from the artificial restrains of the structured social order of the East. Self-reliant men of rugged constitution wandered into the far West with long rifles, sharp knives and a set of steel animal traps. With little else, they made a life for themselves where every day became an adventure. Winters were spent in search of beaver. By day, traps were set and checked, the fresh catches were skinned and the pelts stretched to dry on willow hoop frames. At night, the men hovered around small fires in thrown-together shelters and dreamed of sunshine and springtime. With the coming of spring, the trappers shed their heavy clothes and raised their faces to the warm sun. Here they have constructed a crude mechanical press to prepare the winter’s accumulation of beaver pelts for transportation. The dried pelts are removed from the willow frames folded and pressed into bundles. The bundles were then wrapped in the hides of deer or elk and tied with wet rawhide thongs. The rawhide would shrink as it dried, further compressing the bundles which could weight up to one hundred pounds. Once the work was finished, the men would load the bundles on pack horses or primitive boats for the trip to the trading posts further down stream. If the winter’s catch had been a good one, the men were happy at the prospect of a celebration at the trading post. Already they contemplated where to set their traps during the next winter.